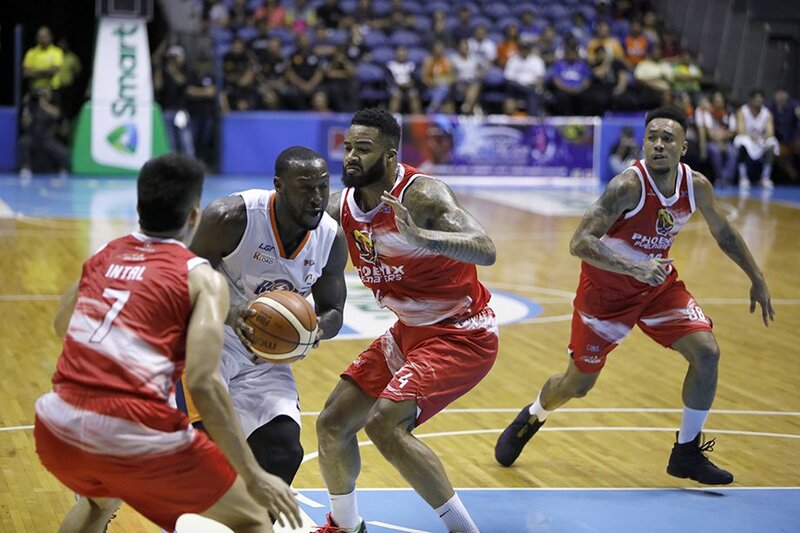 The Meralco Bolts continue their winning run in the Governor’s Cup. The Bolts’ latest win was their biggest as they overcome a twice-to-beat disadvantage to take down the Phoenix Fuel Masters. The Bolts needed an extra period but they got the job done to complete the Semifinals cast. Allen Durham did the heavy lifting but he got a lot of help from Baser Amer in the second half to tow Meralco to the winning side. Durham nearly had a triple-double with 32 points, 21 rebounds and nine assists. Amer finished with 26 points, with 23 coming in the second half and OT. Early in the game, it looked like the Fuel Masters wouldn’t falter for a second straight game. The Phoenix big men showed their deft touch from beyond the arc. Justin Chua, Jason Perkins and Eugene Phelps connected on their shots outside the paint. They pushed their advantage to as high as 16 points in the second quarter before settling for a 10-point spread heading into the half. Coming out of the break, Amer looked more aggressive in his attack. He scored seven of Meralco’s first 11 points in the second half, shaking off his poor shooting in the first half. The Bolts not only got back into the game behind Amer and Durham’s third quarter attack, they even pulled ahead by two heading into the final period. After letting their lead get away from them, the Fuel Masters tried to pull away once again in the fourth quarter. Phelps, Perkins and Matthew Wright pushed Phoenix up by seven heading into the final three minutes. But Amer and Durham had an answer. The two teamed up for an 8-0 blast to push the Bolts up by one with a little over a minute left in the game. Reynel Hugnatan added two freebies to push the lead up to three with nine seconds left in regulation. The Fuel Masters were momentarily saved by Perkins. Wright was double-teamed so he had to give the ball up to Phelps at the top of the key. Phelps swung the ball to the right wing where Perkins didn’t hesitate to launch the game-tying trey to send the game to OT. Amer stayed hot in the extra period. He nailed back-to-back treys to push the Bolts lead up to eight points. Wright and Calvin Abueva battled back to get to within two points but that was the closest they’d get. Hugnatan nailed a jumper to extend the lead and Durham hit clutch freebies to seal the win.